IN 1922 Thomas Edison predicted that "the motion picture is destined to revolutionize our educational system and ... in a few years it will supplant largely, if not entirely, the use of textbooks." Twenty-three years later, in 1945, William Levenson, the director of the Cleveland public schools' radio station, claimed that "the time may come when a portable radio receiver will be as common in the classroom as is the blackboard." Forty years after that the noted psychologist B. F. Skinner, referring to the first days of his "teaching machines," in the late 1950s and early 1960s, wrote, "I was soon saying that, with the help of teaching machines and programmed instruction, students could learn twice as much in the same time and with the same effort as in a standard classroom." Ten years after Skinner's recollections were published, President Bill Clinton campaigned for "a bridge to the twenty-first century ... where computers are as much a part of the classroom as blackboards." Clinton was not alone in his enthusiasm for a program estimated to cost somewhere between $40 billion and $100 billion over the next five years. Speaker of the House Newt Gingrich, talking about computers to the Republican National Committee early this year, said, "We could do so much to make education available twenty-four hours a day, seven days a week, that people could literally have a whole different attitude toward learning." If history really is repeating itself, the schools are in serious trouble. In (1986), Larry Cuban, a professor of education at Stanford University and a former school superintendent, observed that as successive rounds of new technology failed their promoters' expectations, a pattern emerged. The cycle began with big promises backed by the technology developers' research. In the classroom, however, teachers never really embraced the new tools, and no significant academic improvement occurred. This provoked consistent responses: the problem was money, spokespeople argued, or teacher resistance, or the paralyzing school bureaucracy. Meanwhile, few people questioned the technology advocates' claims. As results continued to lag, the blame was finally laid on the machines. Soon schools were sold on the next generation of technology, and the lucrative cycle started all over again. Today's technology evangels argue that we've learned our lesson from past mistakes. As in each previous round, they say that when our new hot technology —the computer—is compared with yesterday's, today's is better. "It can do the same things, plus," Richard Riley, the U.S. Secretary of Education, told me this spring. How much better is it, really? The promoters of computers in schools again offer prodigious research showing improved academic achievement after using their technology. The research has again come under occasional attack, but this time quite a number of teachers seem to be backing classroom technology. In a poll taken early last year U.S. teachers ranked computer skills and media technology as more "essential" than the study of European history, biology, chemistry, and physics; than dealing with social problems such as drugs and family breakdown; than learning practical job skills; and than reading modern American writers such as Steinbeck and Hemingway or classic ones such as Plato and Shakespeare. In keeping with these views New Jersey cut state aid to a number of school districts this past year and then spent $10 million on classroom computers. In Union City, California, a single school district is spending $27 million to buy new gear for a mere eleven schools. The Kittridge Street Elementary School, in Los Angeles, killed its music program last year to hire a technology coordinator; in Mansfield, Massachusetts, administrators dropped proposed teaching positions in art, music, and physical education, and then spent $333,000 on computers; in one Virginia school the art room was turned into a computer laboratory. (Ironically, a half dozen preliminary studies recently suggested that music and art classes may build the physical size of a child's brain, and its powers for subjects such as language, math, science, and engineering—in one case far more than computer work did.) Meanwhile, months after a New Technology High School opened in Napa, California, where computers sit on every student's desk and all academic classes use computers, some students were complaining of headaches, sore eyes, and wrist pain. Throughout the country, as spending on technology increases, school book purchases are stagnant. Shop classes, with their tradition of teaching children building skills with wood and metal, have been almost entirely replaced by new "technology education programs." In San Francisco only one public school still offers a full shop program—the lone vocational high school. "We get kids who don't know the difference between a screwdriver and a ball peen hammer," James Dahlman, the school's vocational-department chair, told me recently. "How are they going to make a career choice? Administrators are stuck in this mindset that all kids will go to a four-year college and become a doctor or a lawyer, and that's not true. I know some who went to college, graduated, and then had to go back to technical school to get a job." Last year the school superintendent in Great Neck, Long Island, proposed replacing elementary school shop classes with computer classes and training the shop teachers as computer coaches. Rather than being greeted with enthusiasm, the proposal provoked a backlash. Interestingly, shop classes and field trips are two programs that the National Information Infrastructure Advisory Council, the Clinton Administration's technology task force, suggests reducing in order to shift resources into computers. But are these results what technology promoters really intend?" You need to apply common sense," Esther Dyson, the president of EDventure Holdings and one of the task force's leading school advocates, told me recently. "Shop with a good teacher probably is worth more than computers with a lousy teacher. But if it's a poor program, this may provide a good excuse for cutting it. There will be a lot of trials and errors with this. And I don't know how to prevent those errors." The issue, perhaps, is the magnitude of the errors. Alan Lesgold, a professor of psychology and the associate director of the Learning Research and Development Center at the University of Pittsburgh, calls the computer an "amplifier," because it encourages both enlightened study practices and thoughtless ones. There's a real risk, though, that the thoughtless practices will dominate, slowly dumbing down huge numbers of tomorrow's adults. As Sherry Turkle, a professor of the sociology of science at the Massachusetts Institute of Technology and a longtime observer of children's use of computers, told me, "The possibilities of using this thing poorly so outweigh the chance of using it well, it makes people like us, who are fundamentally optimistic about computers, very reticent." Perhaps the best way to separate fact from fantasy is to take supporters' claims about computerized learning one by one and compare them with the evidence in the academic literature and in the everyday experiences I have observed or heard about in a variety of classrooms. Five main arguments underlie the campaign to computerize our nation's schools. Computers improve both teaching practices and student achievement. Computer literacy should be taught as early as possible; otherwise students will be left behind. To make tomorrow's work force competitive in an increasingly high-tech world, learning computer skills must be a priority. Technology programs leverage support from the business community—badly needed today because schools are increasingly starved for funds. Work with computers—particularly using the Internet—brings students valuable connections with teachers, other schools and students, and a wide network of professionals around the globe. These connections spice the school day with a sense of real-world relevance, and broaden the educational community. ​"The Filmstrips of the 1990s"
Clinton's vision of computerized classrooms arose partly out of the findings of the presidential task force—thirty-six leaders from industry, education, and several interest groups who have guided the Administration's push to get computers into the schools. The report of the task force, "Connecting K-12 Schools to the Information Superhighway" (produced by the consulting firm McKinsey & Co.), begins by citing numerous studies that have apparently proved that computers enhance student achievement significantly. One "meta-analysis" (a study that reviews other studies—in this case 130 of them) reported that computers had improved performance in "a wide range of subjects, including language arts, math, social studies and science." Another found improved organization and focus in students' writing. A third cited twice the normal gains in math skills. Several schools boasted of greatly improved attendance. Unfortunately, many of these studies are more anecdotal than conclusive. Some, including a giant, oft-cited meta-analysis of 254 studies, lack the necessary scientific controls to make solid conclusions possible. The circumstances are artificial and not easily repeated, results aren't statistically reliable, or, most frequently, the studies did not control for other influences, such as differences between teaching methods. This last factor is critical, because computerized learning inevitably forces teachers to adjust their style—only sometimes for the better. Some studies were industry-funded, and thus tended to publicize mostly positive findings. "The research is set up in a way to find benefits that aren't really there," Edward Miller, a former editor of the Harvard Education Letter, says. "Most knowledgeable people agree that most of the research isn't valid. It's so flawed it shouldn't even be called research. Essentially, it's just worthless." Once the faulty studies are weeded out, Miller says, the ones that remain "are inconclusive"—that is, they show no significant change in either direction. Even Esther Dyson admits the studies are undependable. "I don't think those studies amount to much either way," she says. "In this area there is little proof." Why are solid conclusions so elusive? Look at Apple Computer's "Classrooms of Tomorrow," perhaps the most widely studied effort to teach using computer technology. In the early 1980s Apple shrewdly realized that donating computers to schools might help not only students but also company sales, as Apple's ubiquity in classrooms turned legions of families into Apple loyalists. Last year, after the San Jose Mercury News (published in Apple's Silicon Valley home) ran a series questioning the effectiveness of computers in schools, the paper printed an opinion-page response from Terry Crane, an Apple vice-president. "Instead of isolating students," Crane wrote, "technology actually encouraged them to collaborate more than in traditional classrooms. Students also learned to explore and represent information dynamically and creatively, communicate effectively about complex processes, become independent learners and self-starters and become more socially aware and confident." Crane didn't mention that after a decade of effort and the donation of equipment worth more than $25 million to thirteen schools, there is scant evidence of greater student achievement. To be fair, educators on both sides of the computer debate acknowledge that today's tests of student achievement are shockingly crude. They're especially weak in measuring intangibles such as enthusiasm and self-motivation, which do seem evident in Apple's classrooms and other computer-rich schools. In any event, what is fun and what is educational may frequently be at odds. "Computers in classrooms are the filmstrips of the 1990s," Clifford Stoll, the author of (1995), told The New York Times last year, recalling his own school days in the 1960s. "We loved them because we didn't have to think for an hour, teachers loved them because they didn't have to teach, and parents loved them because it showed their schools were high-tech. But no learning happened." Stoll somewhat overstates the case—obviously, benefits can come from strengthening a student's motivation. Still, Apple's computers may bear less responsibility for that change than Crane suggests. In the beginning, when Apple did little more than dump computers in classrooms and homes, this produced no real results, according to Jane David, a consultant Apple hired to study its classroom initiative. Apple quickly learned that teachers needed to change their classroom approach to what is commonly called "project-oriented learning." This is an increasingly popular teaching method, in which students learn through doing and teachers act as facilitators or partners rather than as didacts. (Teachers sometimes refer to this approach, which arrived in classrooms before computers did, as being "the guide on the side instead of the sage on the stage.") But what the students learned "had less to do with the computer and more to do with the teaching," David concluded. "If you took the computers out, there would still be good teaching there." This story is heard in school after school, including two impoverished schools—Clear View Elementary School, in southern California, and the Christopher Columbus middle school, in New Jersey—that the Clinton Administration has loudly celebrated for turning themselves around with computers. At Christopher Columbus, in fact, students' test scores rose before computers arrived, not afterward, because of relatively basic changes:longer class periods, new books, after-school programs, and greater emphasis on student projects and collaboration. During recent visits to some San Francisco-area schools I could see what it takes for students to use computers properly, and why most don't. On a bluff south of downtown San Francisco, in the middle of one of the city's lower-income neighborhoods, Claudia Schaffner, a tenth-grader, tapped away at a multimedia machine in a computer lab at Thurgood Marshall Academic High School, one of half a dozen special technology schools in the city. Schaffner was using a physics program to simulate the trajectory of a marble on a small roller coaster. "It helps to visualize it first, like 'A is for Apple' with kindergartners," Schaffner told me, while mousing up and down the virtual roller coaster. "I can see how the numbers go into action." This was lunch hour, and the students' excitement about what they can do in this lab was palpable. Schaffner could barely tear herself away. "I need to go eat some food," she finally said, returning within minutes to eat a rice dish at the keyboard. Schaffner's teacher is Dennis Frezzo, an electrical-engineering graduate from the University of California at Berkeley. Despite his considerable knowledge of computer programming, Frezzo tries to keep classwork focused on physical projects. For a mere $8,000, for example, several teachers put together a multifaceted robotics lab, consisting of an advanced Lego engineering kit and twenty-four old 386-generation computers. Frezzo's students used these materials to build a tiny electric car, whose motion was to be triggered by a light sensor. When the light sensor didn't work, the students figured out why. "That's a real problem—what you'd encounter in the real world," Frezzo told me. "I prefer they get stuck on small real-world problems instead of big fake problems" —like the simulated natural disasters that fill one popular educational game. "It's sort of the Zen approach to education," Frezzo said. "It's not the big problems. Isaac Newton already solved those. What come up in life are the little ones." It's one thing to confront technology's complexity at a high school—especially one that's blessed with four different computer labs and some highly skilled teachers like Frezzo, who know enough, as he put it, "to keep computers in their place." It's quite another to grapple with a high-tech future in the lower grades, especially at everyday schools that lack special funding or technical support. As evidence, when U.S. News & World Report published a cover story last fall on schools that make computers work, five of the six were high schools — among them Thurgood Marshall. Although the sixth was an elementary school, the featured program involved children with disabilities — the one group that does show consistent benefits from computerized instruction. Consider the scene at one elementary school, Sanchez, which sits on the edge of San Francisco's Latino community. For several years Sanchez, like many other schools, has made do with a roomful of basic Apple IIes. Last year, curious about what computers could do for youngsters, a local entrepreneur donated twenty costly Power Macintoshes — three for each of five classrooms, and one for each of the five lucky teachers to take home. The teachers who got the new machines were delighted. "It's the best thing we've ever done," Adela Najarro, a third-grade bilingual teacher, told me. She mentioned one boy, perhaps with a learning disability, who had started to hate school. Once he had a computer to play with, she said, "his whole attitude changed." Najarro is now a true believer, even when it comes to children without disabilities. "Every single child," she said, "will do more work for you and do better work with a computer. Just because it's on a monitor, kids pay more attention. There's this magic to the screen." Down the hall from Najarro's classroom her colleague Rose Marie Ortiz had a more troubled relationship with computers. On the morning I visited, Ortiz took her bilingual special-education class of second-, third-, and fourth-graders into the lab filled with the old Apple IIes. The students look forward to this weekly expedition so much that Ortiz gets exceptional behavior from them all morning. Out of date though these machines are, they do offer a range of exercises, in subjects such as science, math, reading, social studies, and problem solving. But owing to this group's learning problems and limited English skills, math drills were all that Ortiz could give them. Nonetheless, within minutes the kids were excitedly navigating their way around screens depicting floating airplanes and trucks carrying varying numbers of eggs. As the children struggled, many resorted to counting in whatever way they knew how. Some squinted at the screen, painstakingly moving their fingers from one tiny egg symbol to the next. "Tres, cuatro, cinco, seis ... ," one little girl said loudly, trying to hear herself above her counting neighbors. Another girl kept a piece of paper handy, on which she marked a line for each egg. Several others resorted to the slow but tried and true—their fingers. Some just guessed. Once the children arrived at answers, they frantically typed them onto the screen, hoping it would advance to something fun, the way Nintendos, Game Boys, and video-arcade games do. Sometimes their answers were right, and the screen did advance; sometimes they weren't; but the children were rarely discouraged. As schoolwork goes, this was a blast. "It's highly motivating for them," Ortiz said as she rushed from machine to machine, attending not to math questions but to computer glitches. Those she couldn't fix she simply abandoned. "I don't know how practical it is. You see," she said, pointing to a girl counting on her fingers, "these kids still need the hands-on" — meaning the opportunity to manipulate physical objects such as beans or colored blocks. The value of hands-on learning, child-development experts believe, is that it deeply imprints knowledge into a young child's brain, by transmitting the lessons of experience through a variety of sensory pathways. "Curiously enough," the educational psychologist Jane Healy wrote in (1990), "visual stimulation is probably not the main access route to nonverbal reasoning. Body movements, the ability to touch, feel, manipulate, and build sensory awareness of relationships in the physical world, are its main foundations." The problem, Healy wrote, is that "in schools, traditionally, the senses have had little status after kindergarten." Ortiz believes that the computer-lab time, brief as it is, dilutes her students' attention to language. "These kids are all language-delayed," she said. Though only modest sums had so far been spent at her school, Ortiz and other local teachers felt that the push was on for technology over other scholastic priorities. The year before, Sanchez had let its librarian go, to be replaced by a part-timer. When Ortiz finally got the students rounded up and out the door, the kids were still worked up. "They're never this wired after reading group," she said. "They're usually just exhausted, because I've been reading with them, making them write and talk." Back in homeroom Ortiz showed off the students' monthly handwritten writing samples. "Now, could you do that on the computer?" she asked. "No, because we'd be hung up on finding the keys." So why does Ortiz bother taking her students to the computer lab at all? "I guess I come in here for the computer literacy. If everyone else is getting it, I feel these kids should get it too." Some computerized elementary school programs have avoided these pitfalls, but the record subject by subject is mixed at best. Take writing, where by all accounts and by my own observations the computer does encourage practice — changes are easier to make on a keyboard than with an eraser, and the lettering looks better. Diligent students use these conveniences to improve their writing, but the less committed frequently get seduced by electronic opportunities to make a school paper look snazzy. (The easy "cut and paste"function in today's word-processing programs, for example, is apparently encouraging many students to cobble together research materials without thinking them through.) Reading programs get particularly bad reviews. One small but carefully controlled study went so far as to claim that Reader Rabbit, a reading program now used in more than 100,000 schools, caused students to suffer a 50 percent drop in creativity. (Apparently, after forty-nine students used the program for seven months, they were no longer able to answer open-ended questions and showed a markedly diminished ability to brainstorm with fluency and originality.) What about hard sciences, which seem so well suited to computer study? Logo, the high-profile programming language refined by Seymour Papert and widely used in middle and high schools, fostered huge hopes of expanding children's cognitive skills. As students directed the computer to build things, such as geometric shapes, Papert believed, they would learn "procedural thinking," similar to the way a computer processes information. According to a number of studies, however, Logo has generally failed to deliver on its promises. Judah Schwartz, a professor of education at Harvard and a co-director of the school's Educational Technology Center, told me that a few newer applications, when used properly, can dramatically expand children's math and science thinking by giving them new tools to "make and explore conjectures. "Still, Schwartz acknowledges that perhaps "ninety-nine percent" of the educational programs are "terrible, really terrible." Even in success stories important caveats continually pop up. The best educational software is usually complex — most suited to older students and sophisticated teachers. In other cases the schools have been blessed with abundance — fancy equipment, generous financial support, or extra teachers — that is difficult if not impossible to duplicate in the average school. Even if it could be duplicated, the literature suggests, many teachers would still struggle with technology. Computers suffer frequent breakdowns; when they do work, their seductive images often distract students from the lessons at hand — which many teachers say makes it difficult to build meaningful rapport with their students. With such a discouraging record of student and teacher performance with computers, why has the Clinton Administration focused so narrowly on the hopeful side of the story? Part of the answer may lie in the makeup of the Administration's technology task force. Judging from accounts of the task force's deliberations, all thirty-six members are unequivocal technology advocates. Two thirds of them work in the high-tech and entertainment industries. The effect of the group's tilt can be seen in its report. Its introduction adopts the authoritative posture of impartial fact-finder, stating that "this report does not attempt to lay out a national blueprint, nor does it recommend specific public policy goals." But it comes pretty close. Each chapter describes various strategies for getting computers into classrooms, and the introduction acknowledges that "this report does not evaluate the relative merits of competing demands on educational funding (e.g., more computers versus smaller class sizes)." When I spoke with Esther Dyson and other task-force members about what discussion the group had had about the potential downside of computerized education, they said there hadn't been any. And when I asked Linda Roberts, Clinton's lead technology adviser in the Department of Education, whether the task force was influenced by any self-interest, she said no, quite the opposite: the group's charter actually gave its members license to help the technology industry directly, but they concentrated on schools because that's where they saw the greatest need. That sense of need seems to have been spreading outside Washington. Last summer a California task force urged the state to spend $11 billion on computers in California schools, which have struggled for years under funding cuts that have driven academic achievement down to among the lowest levels in the nation. This task force, composed of forty-six teachers, parents, technology experts, and business executives, concluded, "More than any other single measure, computers and network technologies, properly implemented, offer the greatest potential to right what's wrong with our public schools." Other options mentioned in the group's report — reducing class size, improving teachers' salaries and facilities, expanding hours of instruction — were considered less important than putting kids in front of computers. "Hypertext Minds"
Today's parents, knowing firsthand how families were burned by television's false promises, may want some objective advice about the age at which their children should become computer literate. Although there are no real guidelines, computer boosters send continual messages that if children don't begin early, they'll be left behind. Linda Roberts thinks that there's no particular minimum age — and no maximum number of hours that children should spend at a terminal. Are there examples of excess? "I haven't seen it yet," Roberts told me with a laugh. 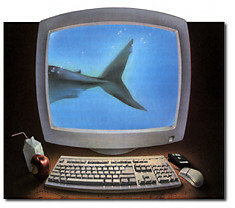 In schools throughout the country administrators and teachers demonstrate the same excitement, boasting about the wondrous things that children of five or six can do on computers: drawing, typing, playing with elementary science simulations and other programs called "educational games." The schools' enthusiasm for these activities is not universally shared by specialists in childhood development. The doubters' greatest concern is for the very young — preschool through third grade, when a child is most impressionable. Their apprehension involves two main issues. First, they consider it important to give children a broad base — emotionally, intellectually, and in the five senses — before introducing something as technical and one-dimensional as a computer. Second, they believe that the human and physical world holds greater learning potential. The importance of a broad base for a child may be most apparent when it's missing. In Endangered Minds, Jane Healy wrote of an English teacher who could readily tell which of her students' essays were conceived on a computer. "They don't link ideas," the teacher says. "They just write one thing, and then they write another one, and they don't seem to see or develop the relationships between them." The problem, Healy argued, is that the pizzazz of computerized schoolwork may hide these analytical gaps, which "won't become apparent until [the student] can't organize herself around a homework assignment or a job that requires initiative. More commonplace activities, such as figuring out how to nail two boards together, organizing a game ... may actually form a better basis for real-world intelligence." Others believe they have seen computer games expand children's imaginations. High-tech children "think differently from the rest of us," William D. Winn, the director of the Learning Center at the University of Washington's Human Interface Technology Laboratory, told Business Week in a recent cover story on the benefits of computer games. "They develop hypertext minds. They leap around. It's as though their cognitive strategies were parallel, not sequential." Healy argues the opposite. She and other psychologists think that the computer screen flattens information into narrow, sequential data. This kind of material, they believe, exercises mostly one half of the brain — the left hemisphere, where primarily sequential thinking occurs. The "right brain" meanwhile gets short shrift — yet this is the hemisphere that works on different kinds of information simultaneously. It shapes our multi-faceted impressions, and serves as the engine of creative analysis. Opinions diverge in part because research on the brain is still so sketchy, and computers are so new, that the effect of computers on the brain remains a great mystery. "I don't think we know anything about it," Harry Chugani, a pediatric neurobiologist at Wayne State University, told me. This very ignorance makes skeptics wary. "Nobody knows how kids' internal wiring works," Clifford Stoll wrote in Silicon Snake Oil, "but anyone who's directed away from social interactions has a head start on turning out weird.... No computer can teach what a walk through a pine forest feels like. Sensation has no substitute." This points to the conservative developmentalists' second concern: the danger that even if hours in front of the screen are limited, unabashed enthusiasm for the computer sends the wrong message: that the mediated world is more significant than the real one. "It's like TV commercials," Barbara Scales, the head teacher at the Child Study Center at the University of California at Berkeley, told me. "Kids get so hyped up, it can change their expectations about stimulation, versus what they generate themselves." In Silicon Snake Oil, Michael Fellows, a computer scientist at the University of Victoria, in British Columbia, was even blunter. "Most schools would probably be better off if they threw their computers into the Dumpster." Faced with such sharply contrasting viewpoints, which are based on such uncertain ground, how is a responsible policymaker to proceed? "A prudent society controls its own infatuation with 'progress' when planning for its young," Healy argued in Endangered Minds. Unproven technologies ... may offer lively visions, but they can also be detrimental to the development of the young plastic brain. The cerebral cortex is a wondrously well-buffered mechanism that can withstand a good bit of well-intentioned bungling. Yet there is a point at which fundamental neural substrates for reasoning may be jeopardized for children who lack proper physical, intellectual, or emotional nurturance. Childhood — and the brain — have their own imperatives. In development, missed opportunities may be difficult to recapture. The problem is that technology leaders rarely include these or other warnings in their recommendations. When I asked Dyson why the Clinton task force proceeded with such fervor, despite the classroom computer's shortcomings, she said, "It's so clear the world is changing." In the past decade, according to the presidential task force's report, the number of jobs requiring computer skills has increased from 25 percent of all jobs in 1983 to 47 percent in 1993. By 2000, the report estimates, 60 percent of the nation's jobs will demand these skills — and pay an average of 10 to 15 percent more than jobs involving no computer work. Although projections of this sort are far from reliable, it's a safe bet that computer skills will be needed for a growing proportion of tomorrow's work force. But what priority should these skills be given among other studies? Listen to Tom Henning, a physics teacher at Thurgood Marshall, the San Francisco technology high school. Henning has a graduate degree in engineering, and helped to found a Silicon Valley company that manufactures electronic navigation equipment. "My bias is the physical reality," Henning told me, as we sat outside a shop where he was helping students to rebuild an old motorcycle. "I'm no technophobe. I can program computers." What worries Henning is that computers at best engage only two senses, hearing and sight—and only two-dimensional sight at that. "Even if they're doing three-dimensional computer modeling, that's still a two-D replica of a three-D world. If you took a kid who grew up on Nintendo, he's not going to have the necessary skills. He needs to have done it first with Tinkertoys or clay, or carved it out of balsa wood." As David Elkind, a professor of child development at Tufts University, puts it, "A dean of the University of Iowa's school of engineering used to say the best engineers were the farm boys," because they knew how machinery really worked. Surely many employers will disagree, and welcome the commercially applicable computer skills that today's high-tech training can bring them. What's striking is how easy it is to find other employers who share Henning's and Elkind's concerns. Kris Meisling, a senior geological-research adviser for Mobil Oil, told me that "people who use computers a lot slowly grow rusty in their ability to think." Meisling's group creates charts and maps—some computerized, some not — to plot where to drill for oil. In large one-dimensional analyses, such as sorting volumes of seismic data, the computer saves vast amounts of time, sometimes making previously impossible tasks easy. This lures people in his field, Meisling believes, into using computers as much as possible. But when geologists turn to computers for "interpretive" projects, he finds, they often miss information, and their oversights are further obscured by the computer's captivating automatic design functions. This is why Meisling still works regularly with a pencil and paper — tools that, ironically, he considers more interactive than the computer, because they force him to think implications through. "You can't simultaneously get an overview and detail with a computer," he says. "It's linear. It gives you tunnel vision. What computers can do well is what can be calculated over and over. What they can't do is innovation. If you think of some new way to do or look at things and the software can't do it, you're stuck. So a lot of people think, 'Well, I guess it's a dumb idea, or it's unnecessary.'" I have heard similar warnings from people in other businesses, including high-tech enterprises. A spokeswoman for Hewlett-Packard, the giant California computer-products company, told me the company rarely hires people who are predominantly computer experts, favoring instead those who have a talent for teamwork and are flexible and innovative. Hewlett-Packard is such a believer in hands-on experience that since 1992 it has spent $2.6 million helping forty-five school districts build math and science skills the old-fashioned way — using real materials, such as dirt, seeds, water, glass vials, and magnets. Much the same perspective came from several recruiters in film and computer-game animation. In work by artists who have spent a lot of time on computers "you'll see a stiffness or a flatness, a lack of richness and depth," Karen Chelini, the director of human resources for LucasArts Entertainment, George Lucas's interactive-games maker, told me recently. "With traditional art training, you train the eye to pay attention to body movement. You learn attitude, feeling, expression. The ones who are good are those who as kids couldn't be without their sketchbook." Many jobs obviously will demand basic computer skills if not sophisticated knowledge. But that doesn't mean that the parents or the teachers of young students need to panic. Joseph Weizenbaum, a professor emeritus of computer science at MIT, told the San Jose Mercury News that even at his technology-heavy institution new students can learn all the computer skills they need "in a summer." This seems to hold in the business world, too. Patrick MacLeamy, an executive vice-president of Hellmuth Obata & Kassabaum, the country's largest architecture firm, recently gave me numerous examples to illustrate that computers pose no threat to his company's creative work. Although architecture professors are divided on the value of computerized design tools, in MacLeamy's opinion they generally enhance the process. But he still considers "knowledge of the hands" to be valuable—today's architects just have to develop it in other ways. (His firm's answer is through building models.) Nonetheless, as positive as MacLeamy is about computers, he has found the company's two-week computer training to be sufficient. In fact, when he's hiring, computer skills don't enter into his list of priorities. He looks for a strong character; an ability to speak, write, and comprehend; and a rich education in the history of architecture. NEWSPAPER financial sections carry almost daily pronouncements from the computer industry and other businesses about their high-tech hopes for America's schoolchildren. Many of these are joined to philanthropic commitments to helping schools make curriculum changes. This sometimes gets businesspeople involved in schools, where they've begun to understand and work with the many daunting problems that are unrelated to technology. But if business gains too much influence over the curriculum, the schools can become a kind of corporate training center — largely at taxpayer expense. For more than a decade scholars and government commissions have criticized the increasing professionalization of the college years — frowning at the way traditional liberal arts are being edged out by hot topics of the moment or strictly business-oriented studies. The schools' real job, the technology critic Neil Postman argued in his book (1995), is to focus on "how to make a life, which is quite different from how to make a living." Some see the arrival of boxes of computer hardware and software in the schools as taking the commercial trend one step further, down into high school and elementary grades. "Should you be choosing a career in kindergarten?" asks Helen Sloss Luey, a social worker and a former president of San Francisco's Parent Teacher Association. "People need to be trained to learn and change, while education seems to be getting more specific." Indeed it does. The New Technology High School in Napa (the school where a computer sits on every student's desk) was started by the school district and a consortium of more than forty businesses. "We want to be the school that business built," Robert Nolan, a founder of the school, told me last fall. "We wanted to create an environment that mimicked what exists in the high-tech business world." Increasingly, Nolan explained, business leaders want to hire people specifically trained in the skill they need. One of Nolan's partners, Ted Fujimoto, of the Landmark Consulting Group, told me that instead of just asking the business community for financial support, the school will now undertake a trade: in return for donating funds, businesses can specify what kinds of employees they want — "a two-way street." Sometimes the traffic is a bit heavy in one direction. In January, The New York Times published a lengthy education supplement describing numerous examples of how business is increasingly dominating school software and other curriculum materials, and not always toward purely educational goals. People who like the idea that their taxes go to computer training might be surprised at what a poor investment it can be. Larry Cuban, the Stanford education professor, writes that changes in the classroom for which business lobbies rarely hold long-term value. Rather, they're often guided by labor-market needs that turn out to be transitory; when the economy shifts, workers are left unprepared for new jobs. In the economy as a whole, according to a recent story in The New York Times, performance trends in our schools have shown virtually no link to the rises and falls in the nation's measures of productivity and growth. This is one reason that school traditionalists push for broad liberal-arts curricula, which they feel develop students' values and intellect, instead of focusing on today's idea about what tomorrow's jobs will be. High-tech proponents argue that the best education software does develop flexible business intellects. In the Business Week story on computer games, for example, academics and professionals expressed amazement at the speed, savvy, and facility that young computer jocks sometimes demonstrate. Several pointed in particular to computer simulations, which some business leaders believe are becoming increasingly important in fields ranging from engineering, manufacturing, and troubleshooting to the tracking of economic activity and geopolitical risk. The best of these simulations may be valuable, albeit for strengthening one form of thinking. But the average simulation program may be of questionable relevance. Tim can keep playing even when he has no idea what is driving events. For example, when his sea urchins become extinct, I ask him why. Tim: "I don't know, it's just something that happens." ST: "Do you know how to find out why it happened?" ST: "Do you mind that you can't tell why?" Tim: "No. I don't let things like that bother me. It's not what's important." Anecdotes like this lead some educators to worry that as children concentrate on how to manipulate software instead of on the subject at hand, learning can diminish rather than grow. Simulations, for example, are built on hidden assumptions, many of which are oversimplified if not highly questionable. All too often, Turkle wrote recently in The American Prospect, "experiences with simulations do not open up questions but close them down." Turkle's concern is that software of this sort fosters passivity, ultimately dulling people's sense of what they can change in the world. There's a tendency, Turkle told me, "to take things at 'interface' value. "Indeed, after mastering SimCity, a popular game about urban planning, a tenth-grade girl boasted to Turkle that she'd learned the following rule: "Raising taxes always leads to riots." The business community also offers tangible financial support, usually by donating equipment. Welcome as this is, it can foster a high-tech habit. Once a school's computer system is set up, the companies often drop their support. This saddles the school with heavy long-term responsibilities: maintenance of the computer network and the need for constant software upgrades and constant teacher training — the full burden of which can cost far more than the initial hardware and software combined. Schools must then look for handouts from other companies, enter the grant-seeking game, or delicately go begging in their own communities. "We can go to the well only so often," Toni-Sue Passantino, the principal of the Bayside Middle School, in San Mateo, California, told me recently. Last year Bayside let a group of seventh- and eighth-graders spend eighteen months and countless hours creating a rudimentary virtual-reality program, with the support of several high-tech firms. The companies' support ended after that period, however — creating a financial speed bump of a kind that the Rand Corporation noted in a report to the Clinton Administration as a common obstacle. School administrators may be outwardly excited about computerized instruction, but they're also shrewdly aware of these financial challenges. In March of last year, for instance, when California launched its highly promoted "NetDay '96" (a campaign to wire 12,000 California schools to the Internet in one day), school participation was far below expectations, even in technology-conscious San Francisco. In the city papers school officials wondered how they were supposed to support an Internet program when they didn't even have the money to repair crumbling buildings, install electrical outlets, and hire the dozens of new teachers recently required so as to reduce class size. One way around the donation maze is to simplify: use inexpensive, basic software and hardware, much of which is available through recycling programs. Such frugality can offer real value in the elementary grades, especially since basic word-processing tools are most helpful to children just learning to write. Yet schools, like the rest of us, can't resist the latest toys. "A lot of people will spend all their money on fancy new equipment that can do great things, and sometimes it just gets used for typing classes," Ray Porter, a computer resource teacher for the San Francisco schools, told me recently. "Parents, school boards, and the reporters want to see only razzle-dazzle state-of-the-art." IT is hard to visit a high-tech school without being led by a teacher into a room where students are communicating with people hundreds or thousands of miles away — over the Internet or sometimes through video-conferencing systems (two-way TV sets that broadcast live from each room). Video conferences, although fun, are an expensive way to create classroom thrills. But the Internet, when used carefully, offers exciting academic prospects — most dependably, once again, for older students. In one case schools in different states have tracked bird migrations and then posted their findings on the World Wide Web, using it as their own national notebook. In San Francisco eighth-grade economics students have E-mailed Chinese and Japanese businessmen to fulfill an assignment on what it would take to build an industrial plant overseas. Schools frequently use the Web to publish student writing. While thousands of self-published materials like these have turned the Web into a worldwide vanity press, the network sometimes gives young writers their first real audience. The free nature of Internet information also means that students are confronted with chaos, and real dangers. "The Net's beauty is that it's uncontrolled," Stephen Kerr, a professor at the College of Education at the University of Washington and the editor of Technology in the Future of Schooling (1996), told me. "It's information by anyone, for anyone. There's racist stuff, bigoted, hate-group stuff, filled with paranoia; bomb recipes; how to engage in various kinds of crimes, electronic and otherwise; scams and swindles. It's all there. It's all available." Older students may be sophisticated enough to separate the Net's good food from its poisons, but even the savvy can be misled. On almost any subject the Net offers a plethora of seemingly sound "research." But under close inspection much of it proves to be ill informed, or just superficial. "That's the antithesis of what classroom kids should be exposed to," Kerr said. This makes traditionalists emphasize the enduring value of printed books, vetted as most are by editing. In many schools, however, libraries are fairly limited. I now volunteer at a San Francisco high school where the library shelves are so bare that I can see how the Internet's ever-growing number of research documents, with all their shortcomings, can sometimes be a blessing. Even computer enthusiasts give the Net tepid reviews. "Most of the content on the Net is total garbage," Esther Dyson acknowledges. "But if you find one good thing you can use it a million times." Kerr believes that Dyson is being unrealistic. "If you find a useful site one day, it may not be there the next day, or the information is different. Teachers are being asked to jump in and figure out if what they find on the Net is worthwhile. They don't have the skill or time to do that." Especially when students rely on the Internet's much-vaunted search software. Although these tools deliver hundreds or thousands of sources within seconds, students may not realize that search engines, and the Net itself, miss important information all the time. "We need less surfing in the schools, not more," David Gelernter, a professor of computer science at Yale, wrote last year in The Weekly Standard. "Couldn't we teach them to use what they've got before favoring them with three orders of magnitude more?" In my conversations with Larry Cuban, of Stanford, he argued, "Schooling is not about information. It's getting kids to think about information. It's about understanding and knowledge and wisdom." It may be that youngsters' growing fascination with the Internet and other ways to use computers will distract from yet another of Clinton's education priorities: to build up the reading skills of American children. Sherry Dingman, an assistant professor of psychology at Marist College, in Poughkeepsie, New York, who is optimistic about many computer applications, believes that if children start using computers before they have a broad foundation in reading from books, they will be cheated out of opportunities to develop imagination. "If we think we're going to take kids who haven't been read to, and fix it by sitting them in front of a computer, we're fooling ourselves," Dingman told me not long ago. This doesn't mean that teachers or parents should resort to books on CD-ROM, which Dingman considers "a great waste of time," stuffing children's minds with "canned" images instead of stimulating youngsters to create their own. "Computers are lollipops that rot your teeth" is how Marilyn Darch, an English teacher at Poly High School, in Long Beach, California, put it in Silicon Snake Oil. "The kids love them. But once they get hooked.... It makes reading a book seem tedious. Books don't have sound effects, and their brains have to do all the work." Computer advocates like to point out that the Internet allows for all kinds of intellectual challenges — especially when students use E-mail, or post notes in "newsgroup" discussions, to correspond with accomplished experts. Such experts, however, aren't consistently available. When they are, online "conversations" generally take place when correspondents are sitting alone, and the dialogue lacks the unpredictability and richness that occur in face-to-face discussions. In fact, when youngsters are put into groups for the "collaborative" learning that computer defenders celebrate, realistically only one child sits at the keyboard at a time. (During my school visits children tended to get quite possessive about the mouse and the keyboard, resulting in frustration and noisy disputes more often than collaboration.) In combination these constraints lead to yet another of the childhood developmentalists' concerns—that computers encourage social isolation. IT would be easy to characterize the battle over computers as merely another chapter in the world's oldest story: humanity's natural resistance to change. But that does an injustice to the forces at work in this transformation. This is not just the future versus the past, uncertainty versus nostalgia; it is about encouraging a fundamental shift in personal priorities — a minimizing of the real, physical world in favor of an unreal "virtual" world. It is about teaching youngsters that exploring what's on a two-dimensional screen is more important than playing with real objects, or sitting down to an attentive conversation with a friend, a parent, or a teacher. By extension, it means downplaying the importance of conversation, of careful listening, and of expressing oneself in person with acuity and individuality. In the process, it may also limit the development of children's imaginations. Perhaps this is why Steven Jobs, one of the founders of Apple Computer and a man who claims to have "spearheaded giving away more computer equipment to schools than anybody else on the planet," has come to a grim conclusion: "What's wrong with education cannot be fixed with technology," he told Wired magazine last year. "No amount of technology will make a dent.... You're not going to solve the problems by putting all knowledge onto CD-ROMs. We can put a Web site in every school — none of this is bad. It's bad only if it lulls us into thinking we're doing something to solve the problem with education." Jane David, the consultant to Apple, concurs, with a commonly heard caveat. "There are real dangers," she told me, "in looking to technology to be the savior of education. But it won't survive without the technology." "Sesame Street"... has been around for twenty years. Indeed, its idea of making learning relevant to all was as widely promoted in the seventies as the Internet is today. So where's that demographic wave of creative and brilliant students now entering college? Did kids really need to learn how to watch television? Did we inflate their expectations that learning would always be colorful and fun? I see a parallel between the goals of "Sesame Street" and those of children's computing. Both are pervasive, expensive and encourage children to sit still. Both display animated cartoons, gaudy numbers and weird, random noises.... Both give the sensation that by merely watching a screen, you can acquire information without work and without discipline. As the technology critic Neil Postman put it to a Harvard electronic-media conference, "I thought that television would be the last great technology that people would go into with their eyes closed. Now you have the computer." The solution is not to ban computers from classrooms altogether. But it may be to ban federal spending on what is fast becoming an overheated campaign. After all, the private sector, with its constant supply of used computers and the computer industry's vigorous competition for new customers, seems well equipped to handle the situation. In fact, if schools can impose some limits — on technology donors and on themselves — rather than indulging in a consumer frenzy, most will probably find themselves with more electronic gear than they need. That could free the billions that Clinton wants to devote to technology and make it available for impoverished fundamentals: teaching solid skills in reading, thinking, listening, and talking; organizing inventive field trips and other rich hands-on experiences; and, of course, building up the nation's core of knowledgeable, inspiring teachers. These notions are considerably less glamorous than computers are, but their worth is firmly proved through a long history. Last fall, after the school administrators in Mansfield, Massachusetts, had eliminated proposed art, music, and physical-education positions in favor of buying computers, Michael Bellino, an electrical engineer at Boston University's Center for Space Physics, appeared before the Massachusetts Board of Education to protest. "The purpose of the schools [is] to, as one teacher argues, 'Teach carpentry, not hammer,'" he testified. "We need to teach the whys and ways of the world. Tools come and tools go. Teaching our children tools limits their knowledge to these tools and hence limits their futures."